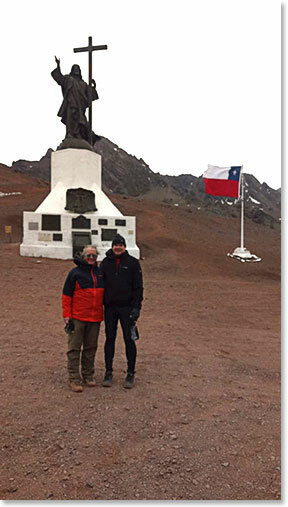 It has been a busy and successful week since John and Rick arrived in South America. First, it is an amazing experience in itself to get on a plane and fly over night from North the South America. Coming from Ontario and New York John and Rick completely changed seasons during those flights. It’s summertime in Mendoza! Mariela and her husband Mati, the staff at the Mendoza Park Hyatt got things off to a relaxing but productive start for John and Rick. 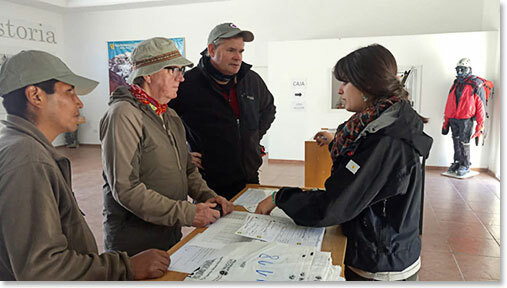 Soon Osvaldo and the guiding team showed up to check equipment for the mountain and go along to have the Aconcagua climbing permits issued. 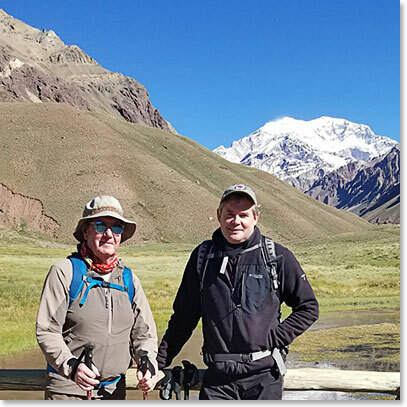 After two nights at the Hyatt the climbing team left for Penitentes, Argentina, near the Chilean border and near the entrance to Aconcagua Park. The elevation of Penitentes is 8,500 feet above sea level, so the acclimatization was already underway! The team spent two nights in Penitentes, at Aylen Hotel, This allowed them to go up to the Chilean border for a hike on Wednesday the 9th. The guys did great and they made it over 13,000 feet for the first time on the trip. 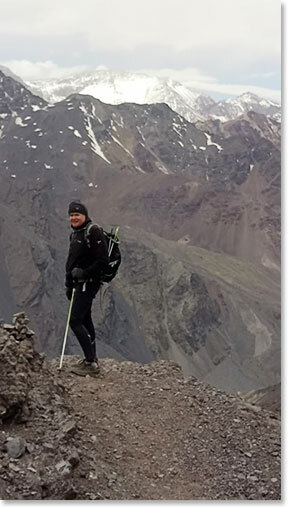 On Thursday they presented their permit at Aconcagua park entrance and the long approach to the mountain began. Mules are carrying the big duffel bags with equipment and supplies. Rick and John got to Confluencia at about 2:00 in the afternoon on Thursday. 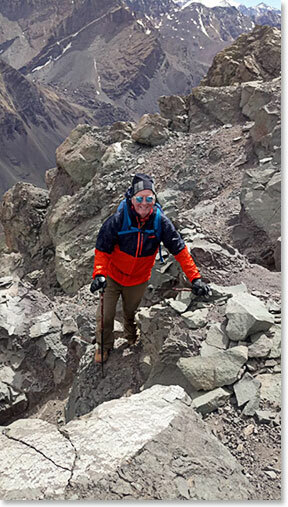 Friday afternoon Osvaldo called us by sat phone to report that the guys had done very well on their acclimatization hike from Confluencia up to over 13,500 underneath the South Face of Aconcagua. When he called it was again 2:00 in the afternoon and they were enjoying snacks prepared in the kitchen at Confluencia: pizza, popcorn, cookies. Well-deserved John and Rick! At 6:00 PM the team has appointments with the doctors at Confluencia for their first evaluation about how they are doing with altitude. 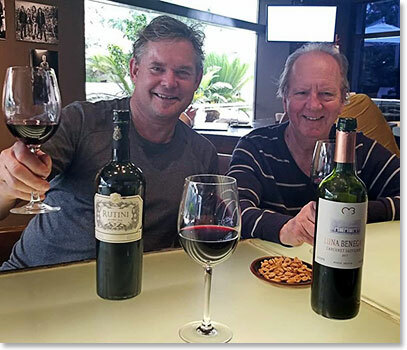 The Park Hyatt welcomed John and Rick with the first Merlots when they arrived on January 6. Gear Check! The guides had the guys put everything out in their rooms at the Hyatt. Rick has been getting this gear together for months. The planning paid off. Time to go to work on the permit applications. The forms are filled out online with BAI staff’s help. John and Rick filling out their application forms. On Tuesday morning the team left for the mountains, Cesar, who has known Berg Adventures teams for the past 14 years help them load up. First stop on the way out of town, pick up and sign the hard copies of our permits. Our first hike was above the Cristo. Rick enjoying a sandwich at 13,000 feet. John on the crest of the Andes! 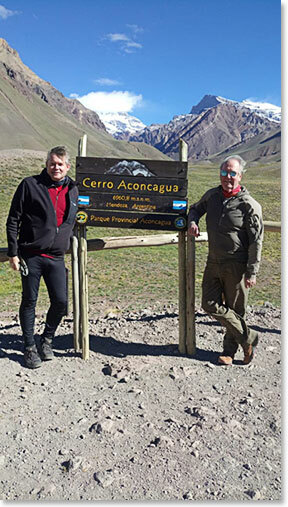 On Thursday, we finally entered Aconcagua Park. Osvi got this photo for the guys with their mountain behind.